Google Maps is an extremely useful service that’s made it easier for people to navigate in the real world, pointing the way to a local movie theater, for example. However, for a few months, the service has also been leading people to places where pirated content is available, online. Spammers are using the “My Maps” feature to bookmark custom locations with links to a wide variety of pirated media. The goal of this strategy is to have these links show up high in search results. This appears to be effective, especially since Google has started to push results from known pirate sites down. These “treasure maps” have captured quite a few eyeballs, as some of the custom maps have already been viewed hundreds of thousands of times. In some cases, the links point to actual torrent sites or download portals, but they are also used to lure people into downloading malware or other scammy content. For example, one of the links we tried triggered an automatic download of “gone_girl_torrent.exe,” which doesn’t promise anything good. And the problem appears to be widespread, with links appearing for all sorts of content. 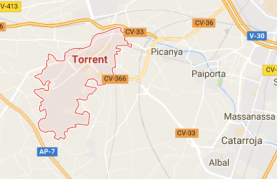 A search for “Mymaps” URLs with the keyword “MP3” returns 44,900 results at the time of writing, and a search for the keywords “torrent download” shows 23,300 results, with a lot of popular video titles. Spammers’ use of Google’s My Maps hasn’t gone unnoticed to copyright holders either. Many of the links have been reported to Google, but thus far the problem remains. Since Google has started to downrank pirate sites in search results, spammers are increasingly using legitimate services to promote their content. Just last week we pointed out a similar problem at Discogs and Change.org has been targeted as well.